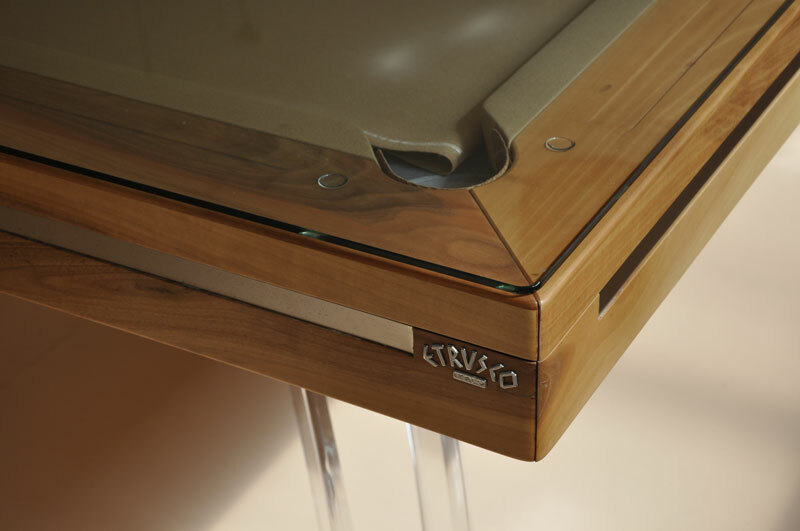 The Etrusco P40 Strike Pool Table comes with Free Delivery and Installation (worth £500), over £800 of Free Accessories, plus we are the sole authorised UK retailer. The P40 has a sleek unassuming design, and great playing characteristics. This special Strike version comes with straight legs, offering a great contrast to the classic P40. This table is supplied with or without a dining top. Should you decide to have a dining top you can choose between wood, glass and plexiglass. These tables are made from solid wood. If you wish, you can specify that the balls, once potted, fall into steel trays protected with transparent film, this is available as an optional extra. As standard the table is fitted with matching leather pockets. The slate is 100% Italian and the cushions are tournament grade, made from Artemis rubber which is made in Germany. The P40 features a solid wood finish, which looks stunning. Should you require a particular stain to be applied to the wood to make it darker, lighter, or natural please call our expert sales team to discuss your requirements. We can also offer varnishes which are either gloss or satin.